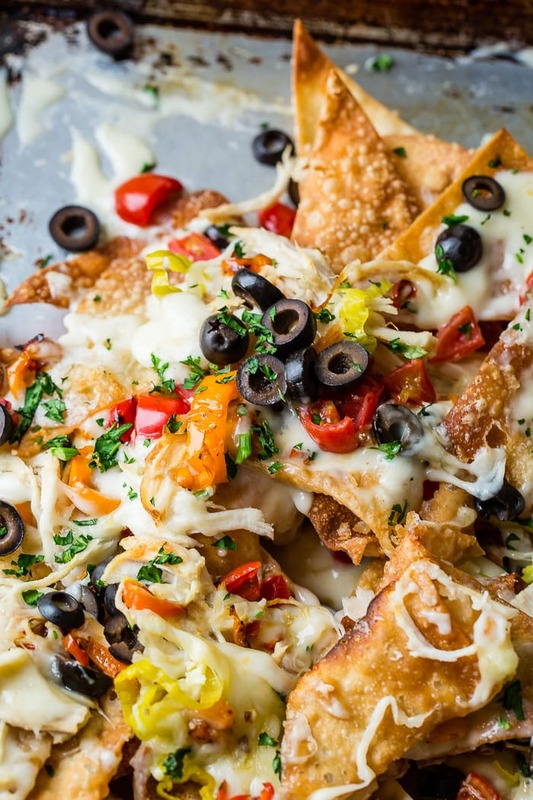 Have you ever ordered an appetizer that you wish you could recreate? Our Easy Fried Ravioli is so good dipped in a yummy sauce and is a great copycat appetizer! 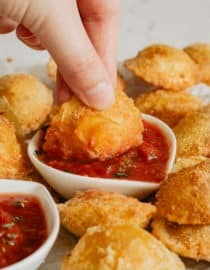 A month ago my hubs and I had these delicious easy fried ravioli at a restaurant and I have been dying to recreate it. Ravioli is such a great go to meal. 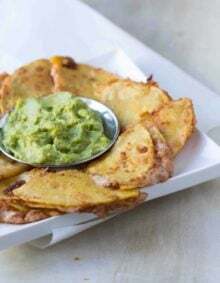 It is so versatile and you can make it into an appetizer or a main dish. If you make your own you can stuff them with cheese, spinach, meat and cheese, cheese and spinach or anything else that you can think of! I’ll be honest though, I don’t often make homemade ravioli, but I do make this easy fried ravioli using store bought pasta! The sauce is really important as well. You can go spicy, traditional Italian, cheese blend, garlic, alfredo or use one of your family favorites. Have you tried our quick and easy spaghetti sauce? 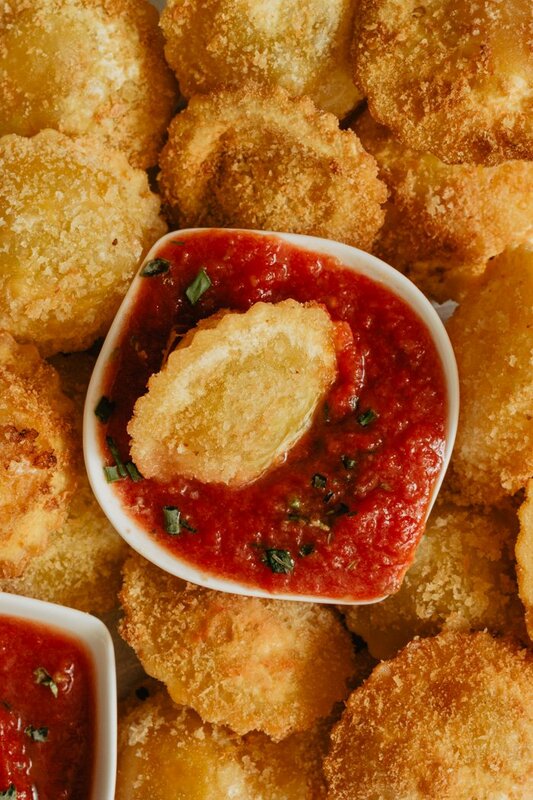 You can freeze it and use it as a dipping sauce whenever you make these easy fried ravioli. The combinations are virtually endless! 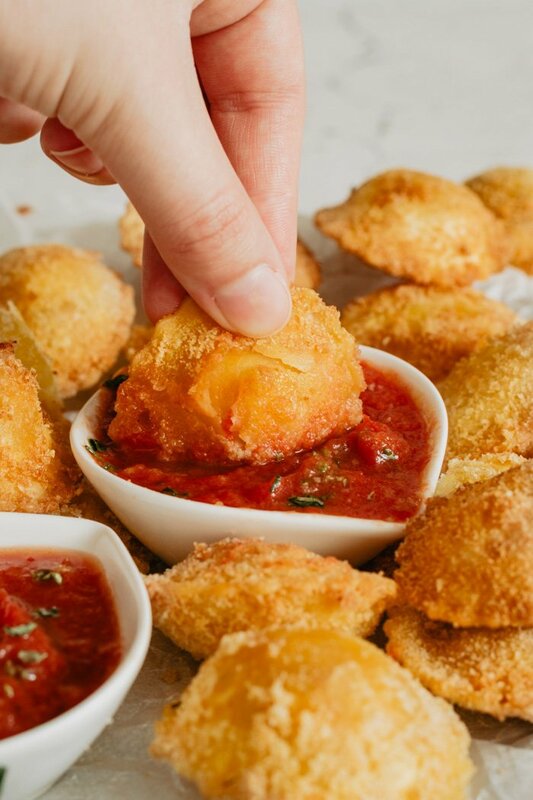 Making easy fried ravioli just adds to the experience. They were nice and crispy on the outside and full of yummy goodness on the inside. 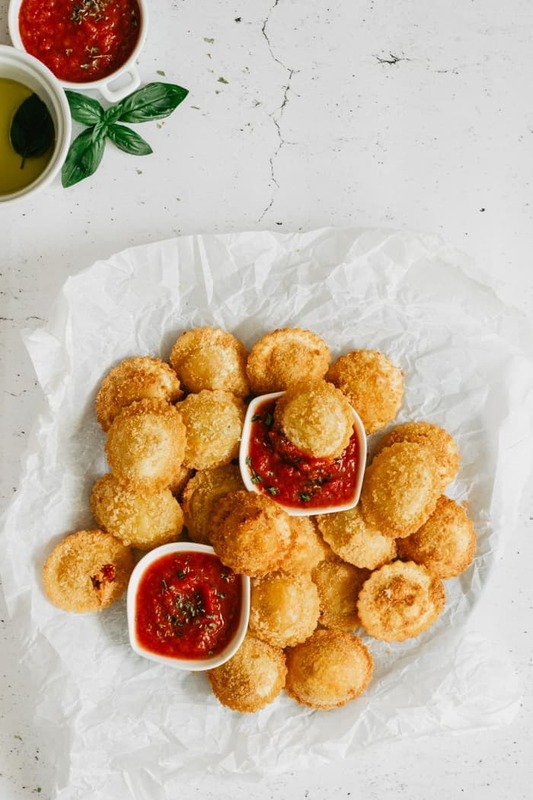 These easy fried ravioli would be perfect for an appetizer at your next get together or even served as a meal for your family. We bought the Buitoni ravioli which is found in the cheese section for our easy fried ravioli, but I am curious if anyone knows a better one with more filling . These really were so good, but I wanted a little more filling to bite into. Just be sure that it’s a good fresh ravioli so it cooks up well. 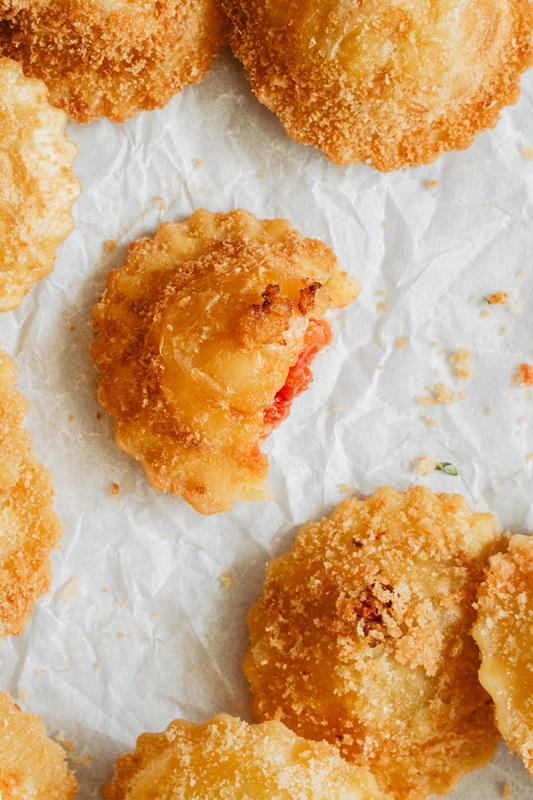 To make this easy fried ravioli, I dipped them in buttermilk instead of egg because the egg on pasta just seemed weird to me. I didn’t want there to be a chance that it would turn out goopy or eggy at all. It worked oh so perfectly! After you dip the pasta in liquid, head straight into the breadcrumbs. We used an Italian breadcrumb but you could also use an Italian Panko breadcrumbs. Panko is just a thicker breadcrumb of Japanese origin. If you can only find regular breadcrumbs just add about 2 teaspoons of dry Italian seasoning and mix well. Heat a pan with oil until it’s just shimmering and begin to add your pasta. I’ll give you a quick hint too, don’t over crowd the pan or it will drop the heat of the oil so they won’t crisp up in a golden brown and on top of that, they will knock into each other and push off the breadcrumbs. Are Ravioli Done When They Float? It should be noted here that floating does not always equal “done”. The best way to test “doneness” is to taste it. Ravioli should be tender, but not soggy. How Long Will Ravioli Last in the Refrigerator? To maximize the shelf life of cooked ravioli for safety and quality, refrigerate the ravioli in shallow airtight containers or resealable plastic bags. How long does cooked ravioli last in the refrigerator? Properly stored, cooked ravioli will last for 3 to 5 days in the refrigerator. What Do You Serve With Ravioli? Ravioli is a great dish all by itself. 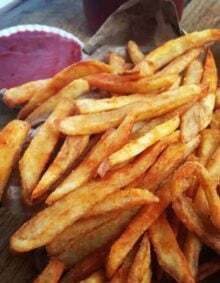 Served with a good sauce (Marinara, Pesto or Alfredo) and grated Parmesan cheese. I usually just serve it with a nice salad and some good crusty Italian bread, because who doesn’t love a side of bread? Looking for more Italian recipes? 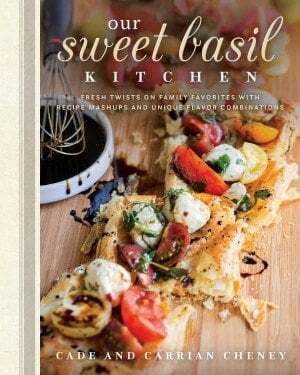 A good Italian recipe is one of my family’s favorite things, so make sure you try our Easy Italian Pasta Salad, Favorite Steak Marinade, 20 Minute Cherry Tomato Basil Angel Hair Pasta, Cheesy Lasagna Calzones or Classic Bruschetta! Or if you really are ready for Italy, have you read about our Complete Guide to Florence, Italy? Heat a skillet with olive oil. About 1/4 inch deep. Coat ravioli in buttermilk and let excess drip off so as to not soak through the bread crumbs. Dredge in bread crumbs and place in oil. Be sure to not overcrowd the pan! Brown on each side and remove to a plate with paper towels. 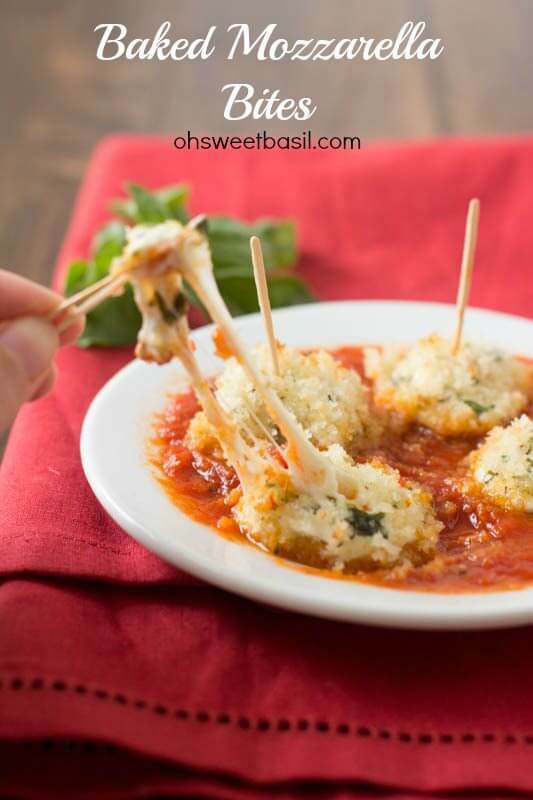 Sprinkle with fresh parmesan and serve with your favorite marinara!! OH MY I recently had some fried ravioli at my favorite restaurant Biaggis at the Gateway and it was to die for. They served it with this insanely good cheesy cream sauce. MMMMMM. 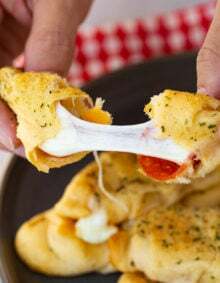 I’ll have to try these and mess around with a cheesy sauce recipe. 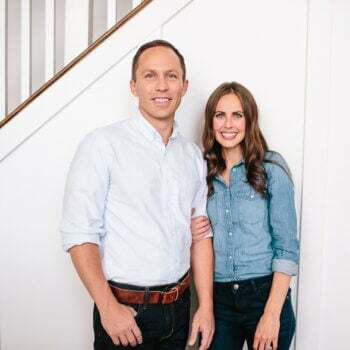 Thanks for your comment on my blog! I have had a recipe kindof like this, but it was baked. Either way, it looks fabulous! Happy New Year- I can’t wait to see what great food you have to share in 2009!